High speed versatile cutting disc. 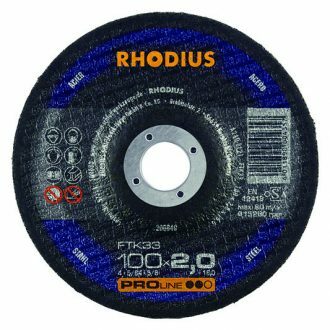 The Rhodius 100mm Cutting Disc FTK33 provides a high cutting speed and comfortable cutting behaviour. Rhodius steel cutting discs are designed for cutting carbon steel and provide excellent results. The Rhodius 100mm Cutting Disc FTK33 easily cuts through solid material as well as thin-walled material. The Rhodius 100mm Cutting Disc FTK33 is part of the PROline series. PROline Cutting Discs are for particularly high demands and frequent use in industry and trades.